Reblogging this from Book Riot because you can never have to many books in the TBR pile. I’ve already ordered one book from this list and I think I’ll try to limit myself to buying 1 or 2 a week because buying all 100, even used, would be more than the budget could support. 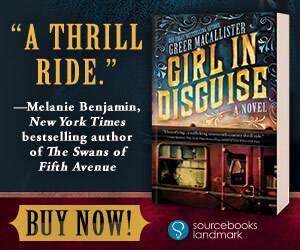 This post is sponsored by Girl in Disguise by Greer Macallister. The streets of 1856 Chicago offer a desperate widow mostly trouble and ruin—unless that widow has a knack for manipulation and an unusually quick mind. In a bold move that no other woman has tried, Kate Warne convinces the legendary Allan Pinkerton to hire her as a detective. like dresses—the true Kate? Or has the real disguise been the good girl she always thought she was? There are a number of solid, worthwhile lists around the internet for readers seeking feminist books. We’ve done some here, and there are entire projects, like the annual Amelia Bloomer List, that round up the best of the best — a list that, if you don’t keep tabs on or build your TBR from, you absolutely should. This list, like those, seeks to highlight some of the best feminist books in YA. But this one goes a little broader: this round-up of 100 must-read books is a round-up of books for YA readers who are seeking to broaden their understanding of what feminism is. This won’t be entirely about “strong female characters.” This won’t be about those books that everyone puts on a list because the female-lead character does things that aren’t “traditionally feminine” — a trend that, for this feminist, is belittling to the wide range of human experiences that fall all along the gender spectrum, “traditional” or not. Sure, some of these books feature those kinds of characters, but this list isn’t about showing off the strongest, the boldest, or the most unfeminine. Rather, this list is about the broader issues feminists care about. It includes stories of class, of race, of sexuality, of gender, of belief, of mind and body wellness, and more. Many of these books might not be what you immediately think of when asked to come up with a feminist book; that’s a good thing. These are books that build upon the base knowledge of what feminism is: equality for all.